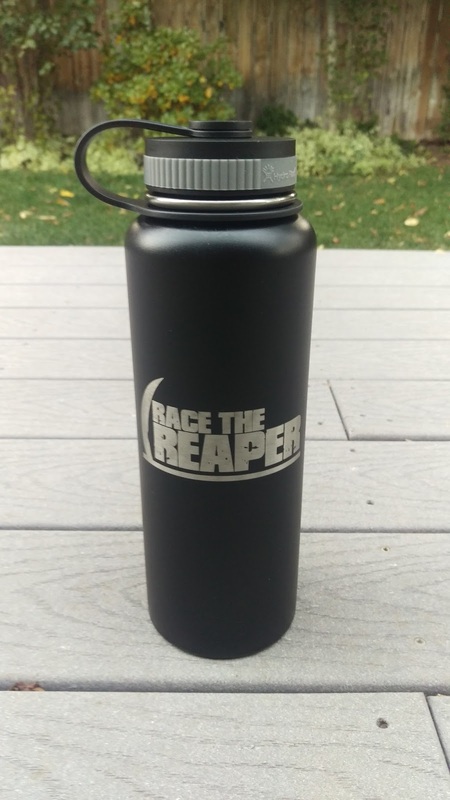 Race the Reaper is an obstacle course race held in Yamhill, OR. 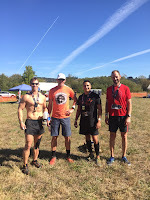 The race organizers claim that their race is the #1 OCR (obstacle course race) event in Oregon. This is the first year I have participated in the event and I was very impressed with the course and challenge of the obstacles. But I would be a bit hesitant to list it as the #1 OCR event in Oregon as there are some flaws that need to be addressed first. Before I go into addressing the flaws of the event (see at the bottom), let me give you a brief account of my race experience. Legs and body were still tired from racing the 13.1 mile obstacle course race, The Inferno, held last weekend. Didn't do too much training this past week leading up to the Race the Reaper; just fine tuning a few things in the gym, some speed work out on the track, and getting as much rest as possible. This weekend's race was only 6 miles, but I had heard that the obstacles would be a bit more challenging. Immediately from the start a young guy and myself went to the front and set the pace up the steep muddy hills; there would be several early and often. I was surprised by how many steep hills there were, but it helped separate the field pretty quick. Unlike The Inferno, where they claim mud is NOT an obstacle, there was plenty of mud this weekend and it definitely made things more difficult, especially the steep descents where the mud felt like clay going down. Fortunately, I wore my Salomon S-Lab Sense 4 shoes that have great tread and it made things pretty manageable. A couple teaser obstacles occurred within the first mile, a net army crawl, and short angled walls that were somewhat hard because they were positioned on a hill. After about a mile we came to the first of two tall obstacles, climbing up and down a ladder-wall, and then the Reaper Wall (two stacked walls each about 6 feet tall) immediately into a steep climb. Shortly after that I got into a fight with a thorny bush. 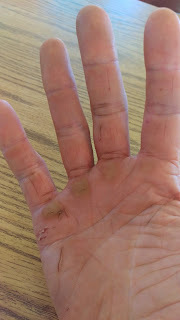 I tried to move a thorn branch that was hanging over the course while running and it ripped the crap out of my hand, leaving it a bloody mess. I was in second at this point trying to pull back the leader. He was setting a good tempo that I felt would be tough to catch. Here is where things start to get a little sketchy. We come to the tire traverse obstacle (tires suspended that you must laterally move from one to the next about 15 feet). The guy in the lead ran past this initially because the volunteer did not give proper instructions. I saw it and began to do the obstacle, while he turned back and followed. So I gained some time on him and for a moment took the lead, He quickly caught back up and regained the lead. A few more obstacles and we reached the most challenging obstacle on the course, the A-Frame ball monkey bar. Much like American Ninja Warrior, this obstacle required us to swing hanging baseballs, much like a monkey bar. Because of the dew in the morning, the balls were extremely slippery and that made getting a grip nearly impossible. None of us in the lead were able to complete the obstacle, and as a result were each given a 1-minute penalty. I think I heard that only 1 or 2 people in the Elite wave completed that obstacle. Immediately after that we did a typical strongman obstacle; moving a keg of beer around a circle three times. More mud, several creek crossings, and steep hills continued for the next several miles before the rope obstacles. First it was the rope climb, and then shortly after it was the rope traverse. My legs were still recovering from last weekend's rope traverse as they got pretty bruised behind the knee from wrapping around the rope. This weekend's rope traverse was much longer and had water below in case you fell off. 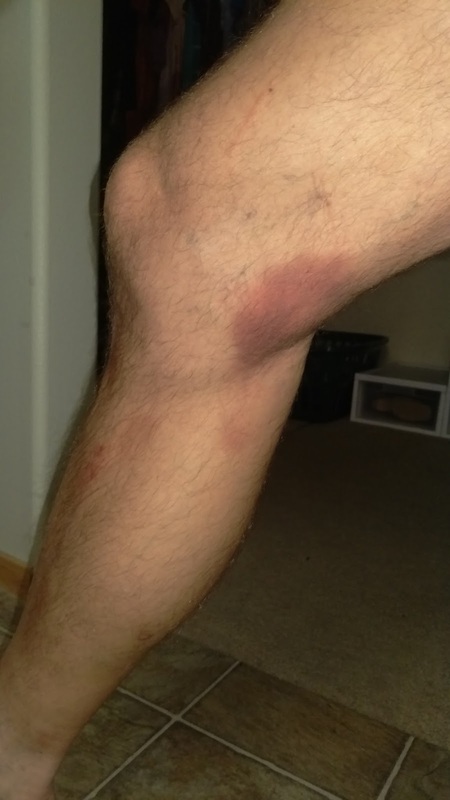 I didn't have much trouble with it, but my legs are now severely bruised as a result, might need to work on my technique. After running through a few more creek beds, we had to run up a steep hill and perform tire runs two different times and then turn around and run back down the same hill. As I was descending, Oscar Zambrano was ascending the hill shortly behind, and then I saw the guy who was initially in the lead. So, he must have gotten off course again some how. I was now in the lead with about 1.5 miles to go. I started to pick up my pace and push it as hard as I could, and as a result, made my own mistake and went of course. Ran through a ribbon section and then quickly realized I was going the wrong way. Turned back and got back on course, but could see Oscar closing in on my lead. The course opened up on some flat sections and I pushed it hard to try and build on my lead. I reached a spot where the course markings were confusing (again) and wasn't sure which way to go. I hopped a barbed wire and started to run, but saw an arrow on the ground facing the opposite direction, so I turned around and went back to the barbed wire. Both Oscar and the other guy caught up and we all ran down a trail only to find out that wasn't the right way either. So we turned around and ran back up and saw the guy who was in 4th place running where I had originally ran past the barbed wire. So we all followed him as it was clear he knew where the course went. So now we were all together and the finish was getting close. A couple inverted walls and some log hops later I was back in the lead heading into the final stretch of obstacles in the main venue area. Some water pits, a fireman's rope descent, and a water slide brought us to the final obstacle, the reverse cargo net jump. Three of us climbed the cargo together and I was the slowest getting down, and as a result finished in 3rd place. Got a pretty cool HydroFlask as the prize. It was a crazy finish to a crazy race. I never felt like there was a moment of the race where I could get comfortable because I was either chasing closely behind the leader or was being chased closely by Oscar and James. Here are my suggestions for the race that would have made the experience a better one. With all of that said, here are all of the things I felt were great. 1. I felt the race course was awesome. The steep hills and deep forest terrain made for a fun and challenging course. 2. The obstacles were unique and definitely challenging at times. 4. The atmosphere before and after the race felt much like a party and there are several obstacles to watch from the venue so it is very spectator friendly for those who are not racing but want to see the action. Once again The Inferno obstacle course race exceeded my expectations. I have to give Jason (event director) and his crew credit for designing one of the best courses around. I am tempted to claim The Inferno as the "Best of the West" in obstacle course races. That might be a biased claim as there are a few races in California that I haven;t down, but for Oregon and Washington, it's hard to find a better course and obstacles. The Inferno has four distances to choose from, a 3 mile course, a 6 mile (actually more like 7.7 mile course), a 13.1 mile course, and their version of the Spartan Ultra Beast, the Skulls Challenge (26.2 mile course). Last year I did the 6 mile course, and this year decided to do the 13.1 mile course. The race is held on a remote course west of Salem on rolling hills. The setting is amazing as it combines open meadow with dark, thick forest terrain. Most of the running is done on open pasture land that makes it very difficult to get into a rhythm. Twisting an ankle is constantly on your mind. There must have been a dozen times I rolled my ankle, and each time it makes you a little more timid. Once in the forest, the trails turn to singletrack with lots of roots and rocks, and also gravel sections where you can open up the stride a bit more. Although Jason claims there was only about 2800-3000 ft of elevation gain, it seemed like twice that amount. Relentless uphill running or uphill log,tire,or cinder block carrying. 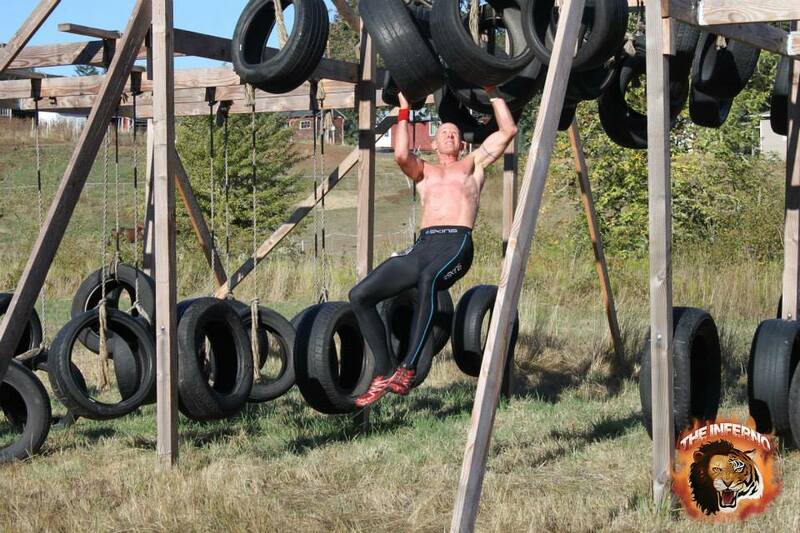 New obstacles were added this year including a 30 burpee station within the first 1/4 mile. If the body wasn't already warmed up (temps in the 60's) it was by the end of the 30 burpees. Then a tire carry was added around mile 1 that required everyone to carry a car tire roughly 3/4 mile up hill and through rough forest trails. More running led to another upper body carry, this time a log. Roughly 30-40 lbs, we had to carry it uphill about 1/2 a mile and then back down. Once we dropped the log, we had to turn around and head back up the same hill running. This has all taken place within the first 2 miles already. 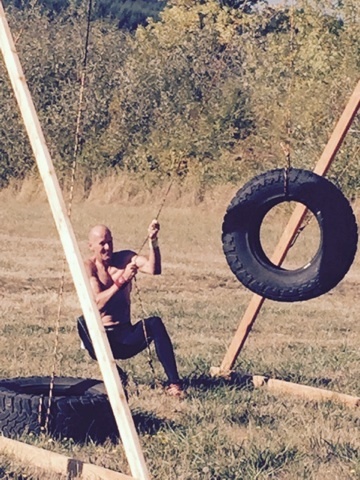 Then several longer sections of running with several obstacles mixed in along the way, including a heavy tractor tire flip, rope climb, tire pull, and 200m swim. 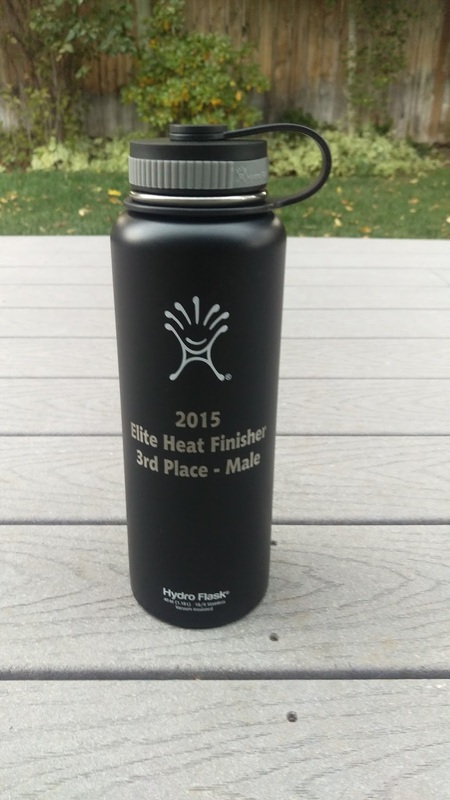 By the time I reached the swim, I was in 1st place while two others were closely behind. After the swim, we had to carry a 5 gal. bucket filled with water around the pond about 300m. 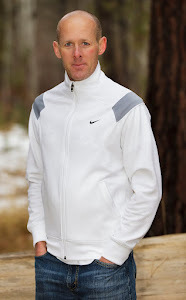 Once I got back, I noticed I had opened a bigger gap and continued to push on with the running. My lead opened up and soon I no longer saw the two other guys behind me. There was an Atlas Stone "obstacle" (round stones weighing between 115-145lbs) that we only had to roll 20 yards, do 10 burpees, and roll back. It would have been quite interesting had we had to carry the stones that distance and back. If you failed an obstacle, or were not able to complete any obstacle (competitive category only) you were assessed a 10 min penalty. 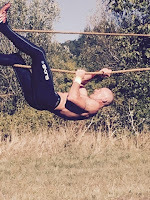 None of the obstacles were too difficult that anyone with descent fitness couldn't complete. 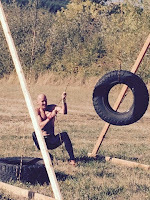 More climbing and descending with some KB Swings, battle rope slams, and jump roping mixed in brought us out back in the open pasture land where the majority of the man-made obstacles remained. Now at mile 9 roughly, the body was definitely getting tired. A couple vertical walls climbed and tire traverse and it was to what I thought the most difficult obstacle in the race...the cinder block drag. We had to drag a cinder block up a steep, rutted hill about 100 yards then across the ridge and back down. That took roughly 8-10 min to complete. Then we had to run back up the steep hill and continue on with more treacherous pasture-land running. One of the obstacles I remember from last year was a tire drag around a dried up pond. That tool about 15-20 minutes to compete. This year they lighted the tire which made it more manageable and only about 5-7 minutes to complete. Finally I rolled into the final section of obstacles and the last 1/2 mile to the finish. 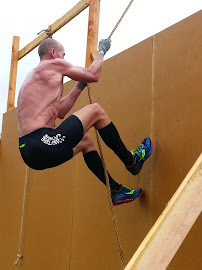 Some more vertical walls to climbs and then on to the final obstacle, what they named, WTF. 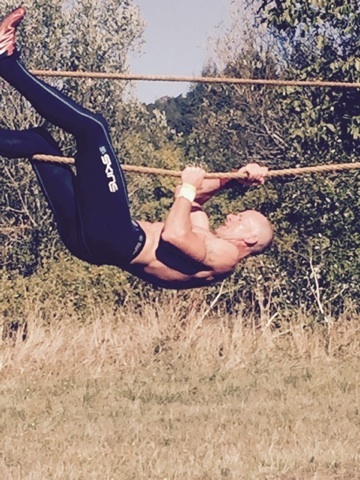 I had a large enough lead on the 2nd and 3rd place guys that I could take my time to complete the obstacle. But I knew if I didn't make it the first time through that it would be tough to try and do a second time. This obstacle remains the most challenging of the course, last year it had a Ninja Warrior theme to it, this year it was a version of the Platinum Rig. 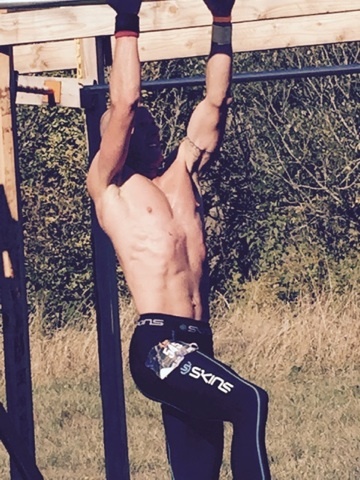 For those who know what the Platinum Rig is know that is requires lots of grip strength and upper body strength. It started with a rope traverse immediately into a inverted monkey bar, to a parallel bar swing and vertical bars, and then finally more monkey bars. My grip started to go once I got to the vertical bars but was able to brace myself against two 2x4's and shake out my hands. 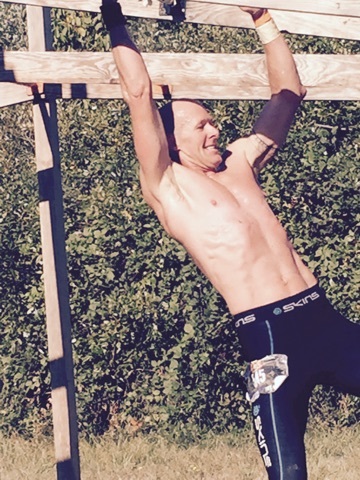 I finished with the last section of monkey bars and ran to the finish happy to be done. I won the race finishing the 13.1 mile course, 30+ obstacles in a time of 2:19:48. I think the 2nd place guy came through around 15 minutes later. Whether you are looking for an entry level obstacle course race (3 mile version) or one to test your strength, endurance and power (13.1 mile version) you will certainly not be disappointed with The Inferno.